A well maintained wood deck looks great and stays that way. Just as regular oil changes help your car run more smoothly and last longer, properly maintaining your deck or porch will help it last longer and look better. The finish, traffic on the deck, and the climate in your area will all impact how often you need to wash, restain, or even completely refinish your deck. A good rule of thumb, however, is to apply a maintenance coat of stain every 18-24 months and completely strip and replace the finish every 4-6 years. Thin or light colored finishes need to be redone more often, typically once per year; heavy traffic and harsh weather conditions, including direct sunlight, can also make finishes fail faster. If, on the other hand, your deck is a dark color, rarely used, and shaded for most of the day, you can probably get away with the bare minimum in maintenance. The maintenance coat reinforces the existing finish of high-traffic areas and evens out fading color. The deck floor, stairs, and the tops of handrails, all areas that see a lot of use, will require the most attention. Pressure wash the deck first to remove mold, algae, and other stains. 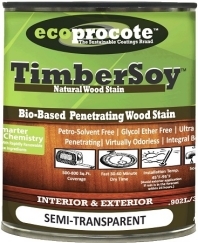 Using a wood brightener will make things easier; simply scrub it on with a stiff brush, allow to rest according to the package directions, then rinse it off using low pressure- no more than 1500 psi. In some cases, a good cleaning is all your deck needs; if the finish is in good condition, you can skip staining until next year. If some areas are worn, lightly sand the damaged spots and adjacent regions, then apply another coat of stain to the entire area; the whole floor, for example, instead of just the worn spots. This will prevent light and dark spots from appearing. After 4-6 years, virtually every deck benefits from a more thorough sanding and restaining. This is also a good time to do repairs, note areas that might become a problem in the future (joists that collect moisture, for example), and reassess your stain choice. Remember, heavily pigmented stains require the least maintenance. Budget a full weekend to refinish your deck; taking your time and doing it right will create a more satisfactory finish. Treating your deck with care will extend the time you can wait between major maintenance projects. 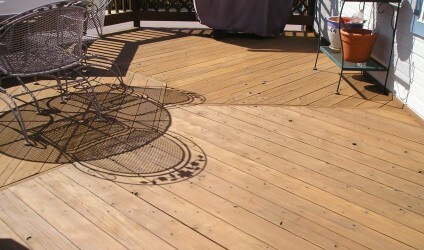 Begin by allowing any finish to dry completely before using the deck. This means using an alternate entrance if possible, leaving furniture and toys on the lawn, and generally limiting activity on the deck. Although the stain will be dry to the touch in a day, the full curing process usually takes a week. The single most important thing you can do to maintain your deck’s finish is to keep it clean. Sweep up dirt before it can scratch the finish; removed leaves and other debris before they get wet and cause tannin stains. A gentle rinse with the hose every few weeks will keep the accumulating grime from taking over; use only plain water. Harsh soaps and detergents can damage the finish if not completely removed. If furniture, planters, or other heavy objects need to be repositioned on your deck, enlist a helper and carry the piece, instead of dragging it. Scuff marks, dings, and gouges can allow moisture to seep into the wood, causing the finish to fail prematurely. Regular deck maintenance might seem like a hassle, but, like changing the oil in your car, you’ll be glad you did it. If you consider the process part of your necessary spring cleaning, you’ll be able to get full use out of your beautiful deck all summer long.